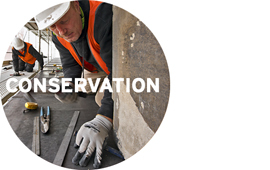 The work of our architecture, conservation and heritage teams comes together in the delivery of building presentation. 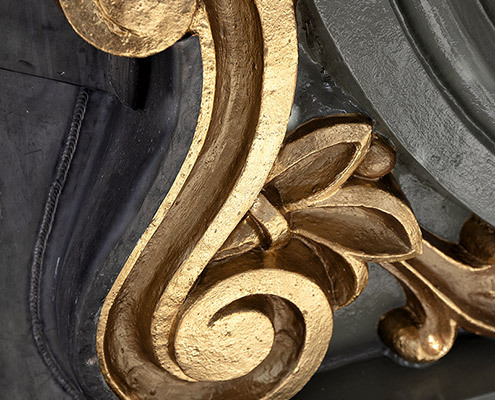 From the detailed restoration of interior and exterior historic decorative treatments to the design of contemporary furniture and fittings for new places in heritage contexts, the combining of our design skills, experience and technical knowledge enables highly resolved outcomes. Presentation is focused on the fabric treatment and contents of a building. It can involve refurbishment, restoration or reconstruction, or we may be called upon to develop new solutions or undertake adaptation — many projects involve aspects of all these activities. Working with heritage buildings of any style or period requires a thorough understanding of place. Decisions need to be made about what to bring back and what is appropriate for current use. We are able to interpret and analyse the significance of different style cycles and advise and guide on ways forward. — Working with experts on the analysis of paint materials, etc. — Sourcing of original or appropriate materials, applied finishes, fabrics, wallpapers, carpets, light fittings, etc. Lovell Chen’s highly trained team brings to this process considerable knowledge and experience of working with all periods of decorative treatments in Australia. We have built up a body of technical knowledge over more than 35 years in this field — integrating research, analytical and design skills. 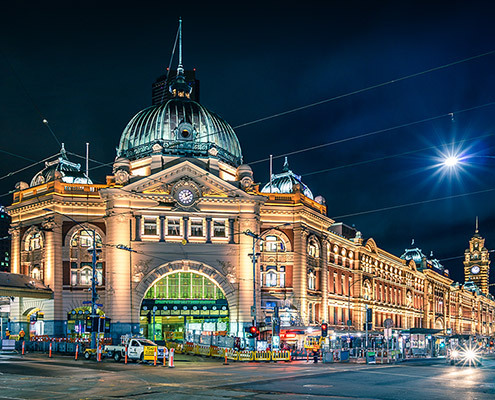 Examples of our work include: the meticulous restoration of the interior of the Gothic Bank in Collins Street, Melbourne; the investigation of the exterior finishes of the dome of the State Library of Victoria and the development of appropriate solutions for its refurbishment; exteriors works at Flinders Street Station and investigations at the Palais Theatre, St Kilda; furniture design and interior scheme for Ormond College Gables Project; and the restoration of the 1935 Myer Mural Hall. Other projects include restoration and refurbishment schemes for places of worship, town halls, adapted industrial buildings, official government residences, museums, historic mansions and individual houses.